The other day someone twittered something about how in this country we never have enough fresh figs to warrant cooking them and that it is a waste to use them any other way than fresh. When I was writing my jam making book last year, I made fig jam for the very first time. At first I didn’t think that the taste was much to write home about and it did take me a while to key into the subtlety of the flavour, but once I had, I became totally hooked. Fresh figs are really lovely and fig jam is very different but just as lovely, with a slightly earthy, flat but fruity taste. 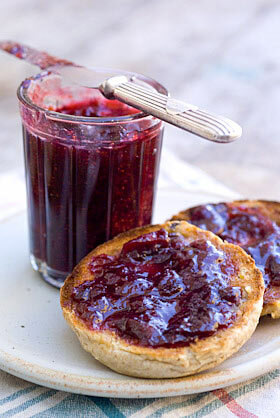 The colour when made into jam is really superb, a rich raspberry pink shade dotted through with tiny seeds. I now only have to think about fig jam and I positively yearn for it. Possibly this year is an especially good year for them here in the UK. I read something in the local paper about a man in Cheltenham who has had a bumper crop and here at Taurus, Georgie in the pottery presented me with a lovely shallow box full of ripe figs picked from a tree in her garden, which I was thrilled to accept. Two or three of them were overly squidgey so I of course had to eat them immediately, but the rest I have made into jam. 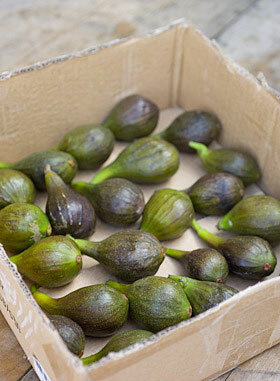 As a glut refers to a large quantity, a sea of something that it is almost impossible to cope with and use up before it goes off and is wasted, I have to disagree with the twitterer’s statement, as there is definitely a limit to how many figs can be eaten in time, in their fresh state. Today, I took a jar of jam to give to Georgie, as a thank you for her gift. She said she had some more figs for me if I want them as they will only rot on the tree otherwise. What a treat. 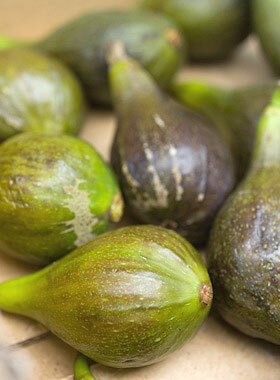 Figs are low in pectin, so need a little help to make into jam with a decent set. I prefer a jam with a softish set anyway and I’m not expecting my fig jam to hang around for months in the larder, so the addition of some lemon juice is all that is required. You can use preserving sugar, which has pectin added to it, instead of the regular variety for a thicker set if you prefer. Place the figs in a pan with 4 tablespoons of water and heat gently to release the juices, adding more water if necessary to prevent the fruit catching on the pan. Bring to a simmer and cook through until pink and juicy with the skins soft. Remove from the heat and leave to cool slightly. Add the sugar and the lemon juice and stir through to help dissolve the sugar, then leave in a covered bowl in a cool place for 12-24 hours. Prepare your jars (and lids), making sure they are squeaky clean and dry before placing them on their sides in a cool oven for 20 minutes or so before they are required. 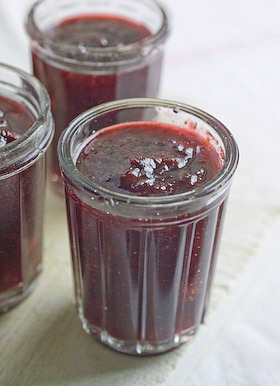 It is a good idea to place your jam funnel and ladle in the oven as well, so everything you use is hot and sterilised. Pour the contents of the bowl into a preserving pan and warm through, stirring to make sure the sugar is completely dissolved, before allowing it to reach boiling point. Boil gently to setting point; you can turn up the heat only so long as you watch it very carefully to be sure your precious jam doesn’t burn. Pour into hot jars, cover and seal. Remember to label (not my strong point!). One of my favourite ways of serving fig jam is on toasted cinnamon and raisin bagels. For some reason this combo is superb. I have photographed it here dolloped onto toasted teacakes. The teacakes served in the cafe, here at Taurus, are always handmade, so they come a pretty close second choice. I adore figs and this sonds wonderful. We’ve had our little fig tree for over a decade and this year was the first time that we managed to get single fruit to ripen fully. The breeze that blows through the wind tunnel that is the Calderdale Valley always knocks them off long before they get anywhere near maturation! Alas, we left it in the fruit bowl for a couple of days where it duly grew mouldy. Oh well, maybe next year we could try your recipe!